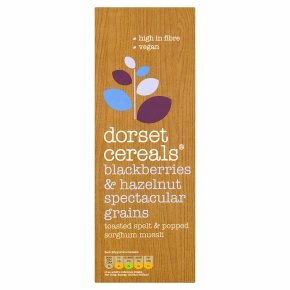 A blend of grains including spelt flakes and popped sorghum, freeze dried blackberries and freeze dried fig slices. Enjoy breakfast on the slow. 23% fruit. Contains 5 different types of grains. High in fibre. Vegetarian Society approved. Suitable for vegans. Kosher - KLBD.